Mort Kunstler Handsigned & Numbered Limited Edition:"In the Hands of Providence"
About the Art: Finally, it was their turn. 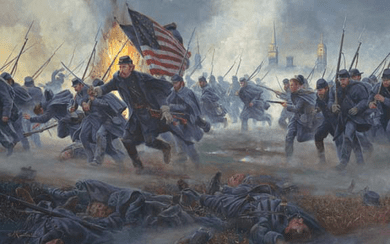 For hours, Lieutenant Colonel Joshua L. Chamberlain and the troops of the 20th Maine had awaited the command to enter combat at the Battle of Fredericksburg. The men from Maine watched with fascination and horror as wave after wave of their fellow soldiers courageously charged across a deadly, open field of fire - and were dashed to pieces by Southern artillery and infantry fire. Now their time had come - and their full initiation to combat would occur at one of the bloodiest battles of America's bloodiest war. "I held my breath and set my teeth together," one of the regiment's officers would later recall, "determined not to show fear if I could�." Faces fixed toward the enemy, they moved forward. Confederate artillery raked the regiment with deadly gusts - yet on they went. They charged "over fences and through hedges," Chamberlain would recall, "over bodies of dead men and living ones, past four lines that were lying on the ground." Like those who went before it, however, the 20th Maine was doomed to fail. After suffering an awful shredding, the regiment was forced back. Even so, on the plains of death at Fredericksburg, the men from Maine - and Joshua Lawrence Chamberlain - forged a reputation for coolness and courage that would follow them to other famous fields of fire and glory. Few events in the war were more memorable or more courageous than the charge of the 20th Maine at the Battle of Fredericksburg. It was this extraordinary event that I wanted to portray as the climactic fourth and final print in the Gods and Generals collection. History records the action of the 20th to be just as heroic in reality as it was depicted in fiction by the novel Gods and Generals and the film that followed it - for which I was honored to serve as official artist. Wave after wave of Union infantry charged the sunken road and impregnable defenses of Marye's Heights. 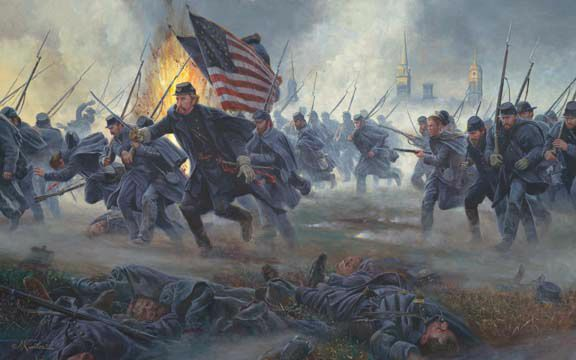 The climax occurred when Lt. Col. Joshua L. Chamberlain led the 20th Maine in the final charge of the battle late in the afternoon of December 13, 1862. The 20th ended up within a stone's throw of the Confederates and spent almost two days and nights under heavy Confederate fire until the 20th was finally withdrawn. I was very fortunate to be able to paint an angle of the final charge that gave me the opportunity to show the sun setting on the spires of Fredericksburg. During the charge, the 20th encountered enfilading fire from artillery and I have used one of the shell bursts to silhouette Chamberlain and make him the center of interest in this painting. The numbers D21 and 48 on the caps of the bodies in the foreground are from the 21st Massachusetts and the 48th Pennsylvania regiments who had charged the open field earlier in the day. I wanted this painting to capture the "organized chaos" of battle, as well as the heroism of Chamberlain and the soldiers of the 20th Maine. What a remarkable soldier and man of character was Joshua Chamberlain. Perhaps the best biography of him is Alice Rains Trulock's In the Hands of Providence. I love the title of the book because it really sums up Chamberlain's personality - he was a man who treasured character, duty, charity, courage and faith. He apparently lived what he believed, and - like Stonewall Jackson - placed his future, whether in war or peace, in what he called "the hands of Providence." I hope this painting - "In the Hands of Providence" - appropriately portrays the heart and heroism of Joshua Lawrence Chamberlain. Unframed Canvas Edition, add (+$325).